Background: Progressive attachment loss around the teeth because of periodontal disease can result in increased tooth mobility. This adversely affects patient's comfort, function, and esthetics. Periodontal splinting helps in accomplishing stability by redistributing the functional and parafunctional forces. There are various materials that have been used for periodontal splinting. Fiber-reinforced composite, composite resin, and metal-reinforced composite are often used as splinting materials for periodontally compromised teeth. In our study, a comparison was done among these materials for their ability to distribute the stresses at different bone levels in mobile lower incisors splinted together with canines. Materials and Methods: Five patients of age group 25–50 years with Grade 2 and 3 mobile incisors having 40% or more bone loss and firm canines with optimal bone support were selected. From the computed tomography scan of each patient, three models were developed demonstrating splinting of mandibular incisors and canines with metal-reinforced composite, fiber-reinforced composite, and composite resin. So in total, 15 models were developed and each one of them was subjected to vertical and transverse loads of 150 N. Pattern of stress distribution was observed in these models using three-dimensional finite element analysis. Results: After splinting, the stress on the canine increased when bone levels around incisors decreased while stress on incisors reduced. Conclusion: Tested splinting materials were successful in stress distribution, and metal-reinforced composite was found to be better than the other splinting materials. Progressive attachment loss around the teeth because of periodontal disease can result in increased tooth mobility. This adversely affects patient's comfort, function, and esthetics. Splinting of teeth can overcome these problems. The reasons are mobile teeth, occlusal trauma, and severe attachment loss. This helps in accomplishing stability by redistributing the functional and parafunctional forces. Among various techniques that have been used for periodontal splinting are composite resin in combination with adhesive systems, fiber reinforced with composite resin, orthodontic wire, and orthodontic wire with composite resin [Figure 1]a, [Figure 1]b, [Figure 1]c.
This study is an attempt to compare the different splinting materials (composite resin, metal-reinforced composite, and fiber-reinforced composite) for their ability to distribute the stresses at different bone levels and analyze the distribution of occlusal stresses that occur in the splinted mobile lower incisors (Grade 2 and 3 mobility) using finite element analysis (FEA). The analysis involves a series of computational procedures to calculate the stress in each element, which performs a model solution. Further, it allows the determination of stress resulting from external force, pressure, thermal change, and other factors. It is extremely useful for indicating mechanical aspects of biomaterials and human tissues that can hardly be measured in vivo. The results obtained can then be studied using visualization software within the FEA environment to view a variety of parameters and to fully identify implications of the analysis. Five patients of age group 25–50 years were selected. The participants had periodontally compromised teeth in lower anterior region with Grade 2 and 3 mobility, but the adjacent canines were with optimal bone support. Intraoral radiovisiography (Vtech EZ 1.5 Sensor Classic) was done on each patient to assess the bone support around each tooth. The clinical and radiographic examinations were found to have at least 40% or more bone loss but no periapical pathology in the mandibular incisor region. Further, each patient was evaluated in three-dimensional (3D) through 64-slice computed tomography (CT) scan, LightSpeed VCT (GE Medical System). From the CT scan of each patient, three models were developed demonstrating splinting of mandibular incisors and canines with metal-reinforced composite, fiber-reinforced composite, and composite resin. So in total, 15 models were developed and each one of them was subjected to vertical and transverse loads of 150 N. Each model had at least 40% or more bone loss. After the loads were applied, pattern of stress distribution was observed in these models using 3D FEA. From each CT scan, 3D model was developed using Medical imaging and editing software Mimics 19.0 (Materialise, Leuven, Belgium). Semiautomatic algorithm was applied in addition with region growing algorithm to interpolate two-dimensional DICOM image data to regenerate the 3D model. To simulate splinting on incisors and canines along with the mandible and periodontal ligament involving various steps, and for the final cases to evaluate the mechanical behavior of the developed models, FEA was conducted in ANSYS 17.0 ANSYS Workbench 17.0 (ANSYS, Canosburg, USA) [Figure 1]d, [Figure 1]e, [Figure 1]f.
Static nonlinear analyses were performed. In total, 15 separate models were generated for the analysis. The object to be studied was graphically simulated in a computer in the form of a mesh that defined its geometry. In a process called discretization, this mesh was divided into a number of subunits termed elements, which were connected at a finite number of points called nodes. The size of the elements determines the accuracy of the calculations. Each model consisted of 27,400–28,000 tetrahedral 3D elements connected by a total of 8500–9000 nodes. The type of elements was SOLID 185 [Figure 2]a, [Figure 2]b, [Figure 2]c.
For statistical analysis, the realistic boundary condition had to be defined to react to the loads. The configurations in the study were constrained from the mandibular regions that simulated the boundary conditions most similar to the anatomical constraints. All the materials were presumed to be elastic, homogenous, linear, and isotropic, except glass fiber which was presumed to be orthotropic. The generated models were grouped based on their material properties, and every element was designated according to its material characteristics [Table 1]., Stress in each model was analyzed under two different loading conditions defined as 150 N vertical and 150 N transverse loading on each tooth crown. All the models were investigated under the splinted tooth orientation with three different splint materials. Stress in a particular zone was analyzed by UMAT Subroutine. All the results were grouped according to loading and reinforcing boundary conditions and the effect of loading direction; bone level and splinting performances were investigated by stress comparison. When the FEA was performed, the stress distribution pattern was observed in the form of color coding bands. Stress distribution in the finite element model came in numerical values and in color coding. Maximum values of von Mises stress were denoted by red color. Minimum values of von Mises stress were denoted by blue color. In-between values were represented by bluish green, green, greenish yellow, and yellowish red in the ascending order of stress distribution [Figure 3]a, [Figure 3]b, [Figure 3]c, [Figure 3]d, [Figure 3]e, [Figure 3]f. For the statistical analysis, one-way ANOVA test was used. Each one of the five models had three material groups: metal reinforced, fiber reinforced, and composite resin. Each material was tested for its ability to distribute stresses on six mandibular anterior teeth grouped into three as canine, lateral incisors, and central incisors under application of the same vertical and transverse loads. From the analysis, the results came to be statistically significant. 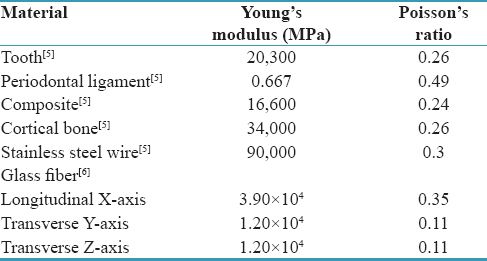 The mean of stress values on teeth in all these five mandibular models with ≥40% bone loss in the anterior region shows that under transverse and vertical loads that were applied on the models, metal-reinforced splinting distributed maximum stress on the canines [Table 2] and [Figure 4]. However, the stresses on central and lateral incisors were least with metal-reinforced splinting. Fiber-reinforced splinting was shown to be distributing least stresses to the canines; however, the stresses on central and lateral incisors were maximum with it as compared to that with other two splinting materials [Table 2] and [Figure 4]a and [Figure 4]b. Composite resin was shown to be intermediate of the two other materials in terms of stress distribution [Table 2], [Figure 4]. However, in terms of quantitative stress distribution, it was comparable to fiber-reinforced one. The stresses on canine were found to be more than with fiber-reinforced splint. Likewise, stress drop in incisors was more than that of fiber-reinforced but less as compared to the metal-reinforced splint [Table 2], [Figure 4]. Splinting may be an appropriate method to regain and maintain proper function in situations where periodontal tissue support is reduced and accompanied by chewing discomfort with masticatory dysfunction. A splint limits the amount of force a single tooth receives during occlusal loading by distributing occlusal forces over a large number of teeth. However, it is very important to assess whether dental splinting would prevent further bone loss, and at which bone level, it has to be applied to make the teeth function properly. There have been some clinical and in vitro studies which have attempted to compare the efficacy of different splinting materials being used. Burcak Cengiz et al. undertook a study to assess the effect of three semi-rigid splint types – a wire composite splint, fiber glass splint, and titanium trauma splint on stresses occurring around traumatized tooth by photoelastic stress analysis. They observed that the use of orthodontic wire resulted in lowest fringe orders (stresses) around the traumatized tooth. Sekhar et al. in their study compared the efficacy of two splinting materials, Ribbond™ ribbon (fiber) and composite with stainless steel wire with composite. More reduction of tooth mobility was seen in “steel group” of 36.11% compared to “Ribbond™ group” of 35.42%. Akcali et al. conducted a clinical study to evaluate the success of two different splint materials: fiber-reinforced composite and stainless steel wire for splinting periodontally treated mobile teeth. They concluded that fiber-reinforced composite splint tended to show increased mechanical limitations compared to wire composite splint. Kurgan et al. conducted a study to analyze the distribution of occlusal stresses for splinted and nonsplinted mandibular anterior incisors and to compare different splinting materials using 3D FEA. The results showed that when bone levels around teeth decreased, the stress on the canine increased. Tested splinting materials were successful in stress distribution, and metal was better than the other splinting materials at distributing the stresses. In our study, the stress distribution ability of three splinting materials – metal reinforced, fiber reinforced, and composite resin around the splinted teeth – was analyzed and compared [Table 2], [Figure 4]. The stresses on bone and splinting materials under vertical and transverse loads were stated as equivalent (von-Mises) stress and in units of MPa (Mega Pascal). The sections of extreme stress were the contact areas of tooth and bone models. The applied load on incisors was selected as 150 N for the analysis, since the maximum occlusal load on incisors had been reported to be between 40 N and 200 N. A 150 N load level is within physiologic limits. The stress values on teeth in all the five mandibular models with ≥40% bone loss in the anterior region showed that metal-reinforced splinting distributed maximum stress on the canines and least on central and lateral incisors. In comparison to metal reinforced, fiber-reinforced splinting distributed least stresses to the canines; however, the stresses on central and lateral incisors were maximum as compared to the other two splinting materials. With composite resin splint, the stresses on canine were found to be slightly more than with fiber-reinforced splint. Likewise, stress drop in incisors was more than that with fiber-reinforced but less as compared to the metal-reinforced splint. 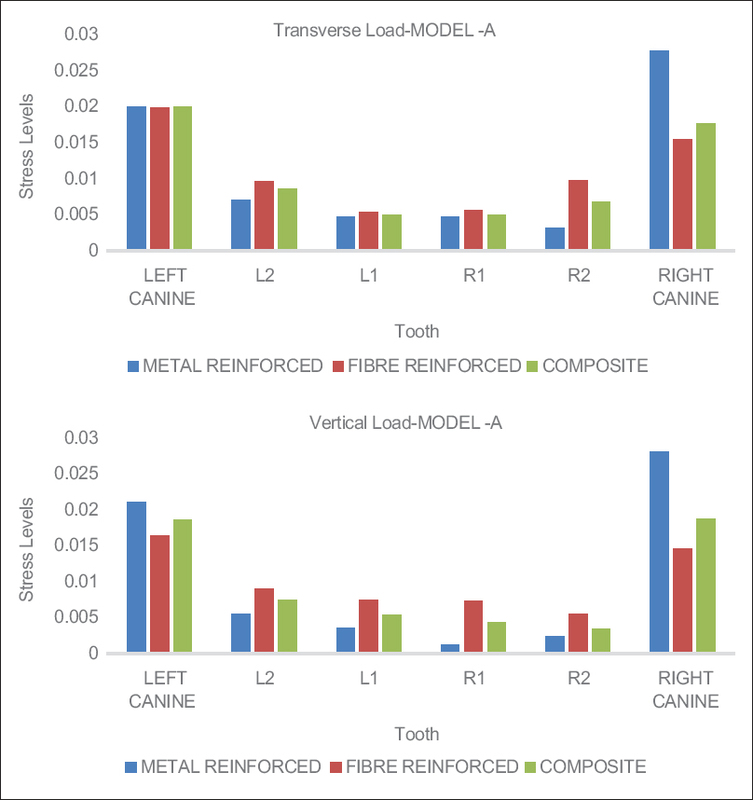 According to these results, it can be stated that the load transfer from central and lateral incisors toward the canine by metal reinforcement is higher compared with the other alternatives. However, there was a collateral effect of splinting that was the increase of stress on the canine. When the stress on each splinted tooth was compared, it was observed that the stress on the central incisor was significantly decreased. There was no significant difference in stress on the lateral incisor; however, a stress increase was observed on the canine due to the load transfer from the central incisor to the canine. According to the current results, there was a stress increase in canines and bone for all splint materials. At ≥40% bone loss, when metal, composite resin, and fiber splinting materials were applied, the stresses on the canine under vertical and transverse loads were in the following order: metal >composite resin >fiber reinforced. This study was limited by some factors. In vitro studies cannot reproduce the highly dynamic nature of oral environment because occlusal loads rapidly change in their extent and direction. However, there is no alternative, as in vivo studies either require radiographic images (which cannot show the extent of bone loss accurately) or they have to be conducted on animals, which again are irrelevant to human; none of other options can show the distribution of forces accurately. Finite element method, though a theoretical representation of the biological system, is the closest simulation method possible to measure the magnitude of stress distribution around teeth. Our study states that when the load transfer exceeds under transverse and vertical loads, destruction of canine begins. In this case, extractions and prosthetic applications can be suggested. The change in load transfer and stress states in the steel wire splinting group demonstrates that its optimal stress distribution may be because of its stiffness due to a higher modulus of elasticity of the material. The work on finite element analysis was conducted in School of Biomedical Engineering, Indian Institute of Technology, Banaras Hindu University, Varanasi, under the guidance of Dr. Sanjay Rai. Ericsson I, Giargia M, Lindhe J, Neiderud AM. Progression of periodontal tissue destruction at splinted/non-splinted teeth. An experimental study in the dog. J Clin Periodontol 1993;20:693-8. Kathariya R, Devanoorkar A, Golani R, Shetty N, Vallakatla V, Bhat MY, et al. To splint or not to splint: The current status of periodontal splinting. J Int Acad Periodontol 2016;18:45-56. Serio FG. Clinical rationale for tooth stabilization and splinting. Dent Clin North Am 1999;43:1-6, v.
Piccioni MA, Campos EA, Saad JR, Andrade MF, Rached AA, Galvão MR. Application of the finite element method in dentistry. RSBO 2013;10:369-77. Gerami A, Dadgar S, Rakhshan V, Jannati P, Sobouti F. Displacement and force distribution of splinted and tilted mandibular anterior teeth under occlusal loads: An in silico 3D finite element analysis. Prog Orthod 2016;17:16. Yokoyama D, Shinya A, Gomi H, Vallittu PK, Shinya A. Effects of mechanical properties of adhesive resin cements on stress distribution in fiber-reinforced composite adhesive fixed partial dentures. Dent Mater J 2012;31:189-96. Sewón LA, Ampula L, Vallittu PK. Rehabilitation of a periodontal patient with rapidly progressing marginal alveolar bone loss: 1-year follow-up. J Clin Periodontol 2000;27:615-9. Burcak Cengiz S, Stephan Atac A, Cehreli ZC. Biomechanical effects of splint types on traumatized tooth: A photoelastic stress analysis. Dent Traumatol 2006;22:133-8. Sekhar LC, Koganti VP, Shankar BR, Gopinath A. A comparative study of temporary splints: Bonded polyethylene fiber reinforcement ribbon and stainless steel wire+composite resin splint in the treatment of chronic periodontitis. J Contemp Dent Pract 2011;12:343-9. Akcali A, Gümüş P, Özcan M. Clinical comparison of fiber-reinforced composite and stainless steel wire for splinting periodontally treated mobile teeth. Braz Dent Sci 2014;17:39-49. Kurgan S, Terzioglu H, Yılmaz B. Stress distribution in reduced periodontal supporting tissues surrounding splinted teeth. Int J Periodontics Restorative Dent 2014;34:e93-101.